The Tigers are a team in transition, and the offense was pesky last season, but didn’t offer a ton of pop. They were silent in the offseason, only bringing in Josh Harrison. He is a utility contact bat that will have some value batting higher in the order. Detroit will get Miguel Cabrera back, and at his age he is still a quality hitter. However, the power isn’t there anymore. Nicholas Castellanos has been one of the better bats in the lineup, but his trade demand makes us wonder if he will be in Detroit much longer. As long as he is, he is the best bat they have in terms of all-around power. Jeimer Candelario and Niko Goodrum are two younger infielder, and both flashed potential. Goodrum had some decent power, but the contact was below average. 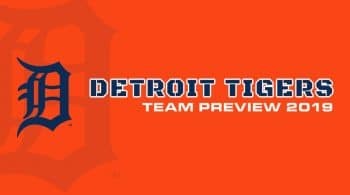 The Tigers had one of the worst rotations in baseball last season, which outside of Cleveland, could be said for many of the AL Central teams. Detroit is going through a full rebuild, and the rotation is going to suffer again this season. To think just a few years ago Justin Verlander and Max Scherzer were leading this rotation, and Rick Porcello was their third option. Things have certainly changed since then. The deal for Jordan Zimmermann a few years ago has been deemed a giant bust, but they don’t have anywhere to go other than him. He finished with a 4.52 ERA last year, and his strikeouts were up a bit which was a positive. It is hard to expect much out of Zimmermann this upcoming season. He is projected for over a 4.50 ERA in the new year, pushing dangerously closing to five. We shouldn’t expect Zimmermann to carry a high strikeout rate, and there really is nobody in this rotation that will. Michael Fulmer had a severe leg injury last season, and over the last few he has been one of the more consistent options for the Tigers. Fulmer stands the best chance to lead the Tigers in ERA this season. Matt Boyd is likely to headline the rotation, which isn’t a good sign. Boyd is a home run prone lefty who has struggled each season in the majors. The lefty had under a 30% groundball rate, which contributes to his career 1.55 HR/9. Boyd is likely going to struggle with these types of number, with maybe the occasional good outing. The Tigers signed Tyson Ross to fill a void in the rotation, and it is not a bad signing given Ross has struggled at times. He relies heavily on his slider, which has given his arm some trouble in the past, but health seems to be on his side now. Ross is going to struggle a bit, but some fresh blood in the Detroit is worth getting excited for. His swinging strike rate was back up from 2017, although it is still down from his career norm which is in the double-digits. Blaine Hardy and Daniel Norris will be fighting for the last spot in the rotation, or if one is struggling they will place him. Norris has not been the prospect he was advertised to be.